Shika 1.2.9 is here with improved Shika JTicketing integration! Shika 1.2.9 is here and brings a complete rewrite of the Shika JTicketing integration with a simplified workflow. Please make sure you are using v2.1.3 of JTicketing with this version of Shika. Besides this feature, we have also introduced the ability to set/update user timezones from the User import in enrollments. Before you upgrade Shika, you must first uninstall the current version of jLike from your site. In this version, we have done some packaging changes due to which you need to specifically follow the upgrade instructions. If you are upgrading to this version from Shika 1.1.x then make sure you read the release notes. In the earlier major release, the Shika JTicketing integration to offer blended learning was broken. This release fixes it with a ground-up rewrite of the integration. From now on enrolling to a course will not auto-enroll the user to included JTicketing events giving them a choice and the admin better visibility on who is attending. The event representation on the course table of contents view has also been improved. This of course also brings back the ability to include Adobe Connect Webinars in Shika Courses. The import tool which allows for mass import and enrollment of users has now been updated to let you update the user’s timezone. #128475 Backend>>Courses>>Grey screen is appearing for Text and Media lesson type if load bootstrap manually is set to 'NO'. #127843 Courses>> If the user is deleted then gives warning "JUser: :_load: Unable to load user"
#127597 Backend>>Payment plugins are missing. #127581 Backend>>Courses>>If course creator is deleted then 'created by' column field displays blank. #127345 Improved UI for answer-sheet in a front panel. #127079 Once the user is unpublished, it should not appears on assign and recommend user list on the front panel. #126885 Front end>>Activities>> If the user is deleted then giving warning " JUser: :_load: Unable to load user"
#126630 TOC>>Giving notice, if the creator of the course is disabled. #120972 Reports>>Student course report>>Completed date>>Time is appearing incorrect. #116959 Front panel>> All courses>>Select Category >>when category name is long, UI gets messed up. #116722 Front end>>TOC>>Hand cursor is not coming on clicking the "Assign" & "Recommend" link. #104422 Changed Placeholder on certificate search tool. 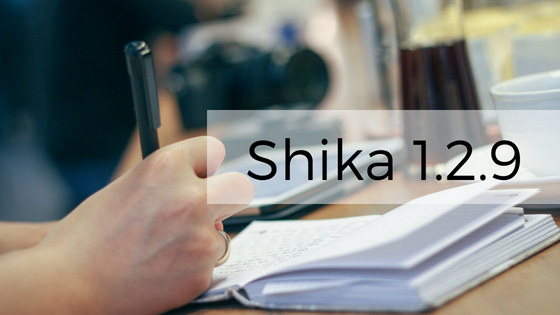 Friday, 12 April 2019 Shika 1.3.9 is here! How to create widgets for your Shika user dashboard?